The newly designed 2007 Toyota Yaris subcompact cars will make its U.S. debut this year when it arrives in showrooms this spring in four-door Sedan and three-door Liftback configurations, according to an official Toyota press release dated December 26th. First launched in Europe in 1999, the Yaris has since earned European "Car of the Year" and Japanese "Car of the Year" honors in 2000 making it the first time one vehicle captured both honors in the same year. It has also become Toyota's best-selling model in the European market where it accounts for 25% of all Toyota sales in the region and is very popular in Japanese markets as well. 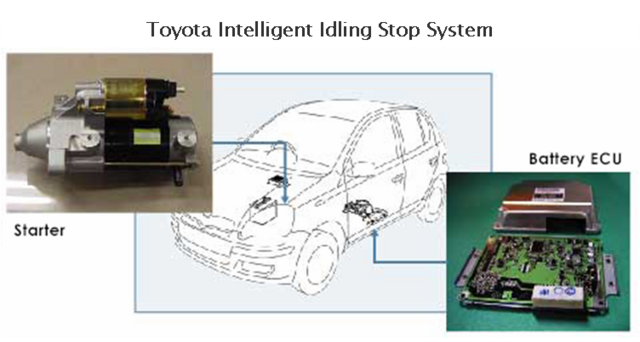 Toyota has targeted the newly redesigned model for sales of at least 10,000 units per month in Japan where it sells as the Vitz and features Toyota's 'Intelligent Idling Stop System' and a continuously variable transmission (CVT). The Yaris/Vitz is the third-highest volume production Toyota model behind Corolla and Camry, with more than 2.5 million units sold in the past five years, according to Green Car Congress. For the U.S. subcompact market, the new Yaris will replace the unsuccseful Echo sedan. U.S. sales of the Echo were anemic prompting Toyota to pull the plug on the model. Now, with the U.S. market seemingly more concerned with fuel economy, Toyota has hopes that the Yaris will be more popular than their failed predescessors (by the way, the name Echo is officially retired and the new U.S. models will feature the same name as their European counterparts). The new Yaris made their debut this fall at the Frankfurt IAA auto show (GCC report here) and are slightly roomier than their predecessors. The American version will (intially, at least) feature a larger engine than their European and Japanese counterparts, the same 1.5-liter, 16-valve inline four cylinder engine that's used in the American Scion xA and xB models. Equipped with variable valve timing (VVT-i), this engine makes 106 hp at 6,000 rpm and 103 pound-feet (lb-ft) of torque at 4,200 rpm. A preliminary EPA fuel economy rating pegs both the sedan and the liftback at 34 city/40 highway for the five-speed manual and 34 city/39 highway for models equipped with the four-speed automatic putting the Yaris among the most fuel efficient in the U.S. subcompact segment. All Yaris models with an automatic transmission will be equipped with uphill/downhill shift logic to help reduce the frequency of gear shifting caused by the operation of the accelerator pedal during winding uphill and downhill driving, according to the press release. Both the sedan and lifback will have a coefficient of drag of just 0.29 allowing them to slip through the air with relative ease, promising a quieter ride and greater fuel economy at freeway speeds. Toyota is confident that Yaris will be EPA-certified as an Ultra-Low Emission vehicle (ULEV II). In Europe, the Yaris will come standard with a smaller 1.3-liter, four cylinder VVT-i gasoline engine carried over from the current range with 87 hp (65 kW) at 6,000 rpm and 89 lb-ft (121 Nm) of torque at 4,200 rpm. A diesel model will also be available in Europe featuring the latest version of the 1.4-liter D-4D 90 diesel which now develops 90 hp (68 kW) at 3,600 rpm and 140 lb-ft (190 Nm) of torque from 1,800 to 3,600 rpm. The D-4D can quickly accelerate the Yaris to 60 mph (100 km/h) in 10.7 seconds, making it the fastest car in the segment amongst those equipped with 1.3—1.5 liter diesel engines, according to GCC. New to the European Yaris range is the advanced 1.0-liter, three cylinder VVT-i gasoline engine which made it debut in the Toyota AYGO city car, and replaces the older 1.0-liter powerplant option. The new 1.0-liter engine weighs just 148 pounds (67 kgs) yet delivers 60 hp (45 kW) at 6,000 rpm and 68.5 lb-ft (93 Nm) of torque. As mentioned above, the Japanese version sells as the Vitz and is available with all three (1.0, 1.3 or 1.5 liter) gasoline options, and features CVT as well as Toyota's idle stop-start system. It should thus get significantly better gas mileage (especially in the city) than either the European or American versions. GCC reports that the Vitz gets 60 mpg with the 1.0 liter engine and, according to Toyota, has the best gasoline fuel consumption in Japan, excluding minivehicles and hybrids. According to the press release, the Yaris liftback will be available in only one trim, while the sedan will offer two trims, adding a sport-themed Yaris S.
It's a shame that the U.S. model won't be available either with a smaller engine or with the CVT and idle start-stop system of its European and Japanese counterparts. With better tuning for fuel efficiency and a smaller engine, not to mention the addition of CVT and an idle stop system, the subcompact Yaris could be getting significantly better fuel economy, as is evidenced by the Japanese Vitz. Treehugger has some new pictures of a 2007 Yaris Liftback (two door model) from a kind soul who attended the 2006 L.A. Auto Show as well as a couple pics of the 2006 Canadian four-door lifback model here. The kindly Treehugger reader also reports that the MSRP of the pictured two-door liftback model will be $10,200.00 (USD), pretty darned inexpensive for one of the best-selling small cars in the world. Adding a few options on, the price will likely bump up to around $13k but that's still not bad. I just bought a Yaris 4 door sedan last week. I love it!! I'm getting about 36-37 miles to the gallon. I had to go to a couple of different dealers to find one. The salesman said they sell as fast as they get them in. That's great to hear, Happygirl. I've been starting to see them pop up on the road around here (Portland, OR) as well. I like the look of them quite a bit better than the old Echo. If only they had a hybrid version ... I'm still waiting on the first economy-class hybrid (since Honda quashed the rumors on the Fit hybrid). If they offered a diesel in the U.S., I would have one already. With cleaner diesel mandated 1/1/07 this should be a no brainer. 60+mpg !!!!! and it goes 106mph!! I just went to the Seattle Auto Show today, 10/28/06, and at the Toyota booth I asked the Toyota rep from the factory about the D4-D Yaris. He told me "they were in the process of certifying the diesel through a private contractor and hoped it would be ready for US sales soon." I got it from the man! I will buy one as soon as it is available with the D4-D.